Due to the App Store rules for apps that were created for young children, we were unable to put the Manage Account menu within the mobile and tablet applications. You may find the Manage Account menu after logging in via the web on mobile, tablet, or desktop/laptop. 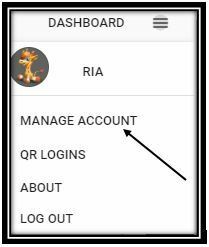 If you logged in via a QR Code or using the URL from the QR Logins screen, we also hide the Manage Account menu, and the other students so that it is locked to only the student who is currently using the app.